A: I told you, I’m not allowed to argue unless you’ve paid. M: Look, I don’t want to argue about that. A: Well, you didn’t pay. M: Aha. If I didn’t pay, why are you arguing? I Got you! M: Yes I have. If you’re arguing, I must have paid. A: Not necessarily. I could be arguing in my spare time. And now for something completely different. I decided to get off the soap box I kept climbing recently and give you some useful code for a change. I cannot stray too much from the topic of micro-services (because that is our reality now), or Node.js (because they is the technology with which we implement that reality). But I can zero in on a very practical problem we unearthed this week. First, a refresher. When creating a complex distributed system using micro-services, one of the key problems to solve is to provide for inter-service communication. Micro-services normally provide REST APIs to get the baseline state, but the system is in constant flux and it does not take long until the state you received from the REST API is out of date. Of course, you can keep refreshing your copy by polling but this is not scalable and adds a lot of stress to the system, because a lot of these repeated requests do not result in new state (I can imagine an annoyed version of Scarlett Johansson in ‘Her’, replying with ‘No, you still have no new messages. Stop asking.’). A better pattern is to reverse the flow of information and let the service that owns the data tell you when there are changes. This is where messaging comes in – modern micro-service based systems are hard to imagine without a message broker of some kind. Another important topic of a modern system is scalability. In a world where you may need to quickly ramp up your ability to handle the demand (lucky you! ), an ability to vertically or horizontally scale your micro-services on a moments notice is crucial. An important Node.js quirk explainer: people migrating from Java may not understand the ‘vertical scalability’ part of the equation. Due to the auto-magical handling of thread pools in a JEE container, increasing the real or virtual machine specs requires no effort on the software side. For example, if you add more CPU cores to your VM, JEE container will spread out to take advantage of them. If you add more memory, you may need to tweak the JVM settings but otherwise it will just work. Of course, at some point you will need to resort to multiple VMs (horizontal scalability), at which point you may discover that your JEE app is actually not written with clustering in mind. Bummer. Notice, however, that for Node.js, vertical and horizontal scalability is the same regarding the way you write your code. You need to cluster just to take advantage of all the CPU cores on the same machine, never mind load balancing multiple separate servers or VMs. I actually LOVE this characteristic of Node.js – it forces you to think about clustering from the get go, discouraging you from holding onto data between requests, forcing you to store any state in a shared DB where it can be accessed by all the running instances. This makes the switch from vertical to horizontal scalability a non-event for you, which is a good thing to discover when you need to scale out in a hurry. Nothing new here, just basic share-nothing goodness (see 12factors for a good explainer). If you try to launch multiple Node servers on a single machine like this, all except the first one will fail because they cannot bind to the same port. However, if you use Node’s ‘cluster’ module (or use PM2 with uses the same module under the covers), a little bit of white magic happens – the master process has a bit of code that enables socket sharing between the workers using a policy (either OS-defined, or ’round-robin’ as of Node 0.12). This is very similar to what Nginx does to your Node instances running on separate servers, with a few more load balancing options (round-robin, least connected, IP-hash, weight-directed). So far, so good. Now, as it is usual in life, the fun starts when you combine the two concepts I talked about (messaging and clustering) together. To make things more concrete, let’s take a real world example (one we had to solve ourselves this week). We were writing an activity stream micro-service. Its job is to collect activities expressed using Activity Stream 2.0 draft spec, and store them in Cloudant DB, so that they can later be retrieved as an activity stream. This service does one thing, and does it well – it aggregates activities that can originate anywhere in the system – any micro-service can fire an activity by publishing into a dedicated MQTT topic. On the surface, it sounds clear cut – we will use a well behaved mqtt module as a MQTT client, RabbitMQ for our polyglot message broker, and Node.js for our activity micro-service. This is not the first time we are using this kind of a system. However, things become murky when clustering is added to the mix. This is what happens: MQTT is a pub/sub protocol. 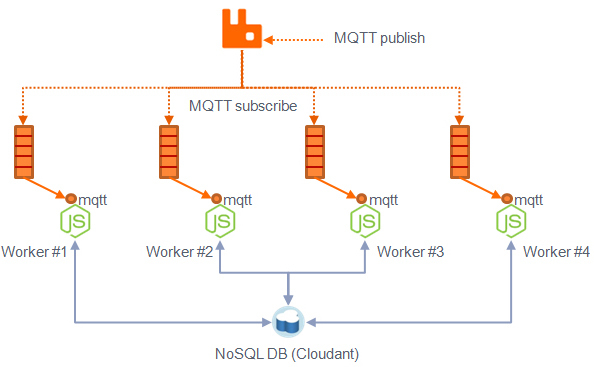 In order to allow each subscriber to read the messages from the queue at its own pace, RabbitMQ implements the protocol by hooking up separate queues for each Node instance in the cluster. This is not what we want. Each instance will receive a ‘new activity’ message, and attempt to write it to the DB, requiring contention avoidance. Even if the DB can prevent all but one node to succeed in writing the activity record, this is wasteful because all the nodes are attempting the same task. The problem here is that ‘white magic’ used for the clustering module to handle http/https server requests does not extend to the mqtt module. Our initial thoughts around solving this problem were like this: if we move the message client to the master instance, it can react to incoming messages and pass them on to the forked workers in some kind of ’round- robin’ fashion. It seemed plausible, but had a moderate ‘ick’ factor because implementing our own load balancing seemed like fixing a solved problem. In addition, it would prevent us from using PM2 (because we had to be in control of forking the workers), and if we used multiple VMs and Nginx load balancing, we would be back to square one. Fortunately, we realized that RabbitMQ can already handle this if we partially give up the pretense and acknowledge we are running AMQP under the MQTT abstraction. 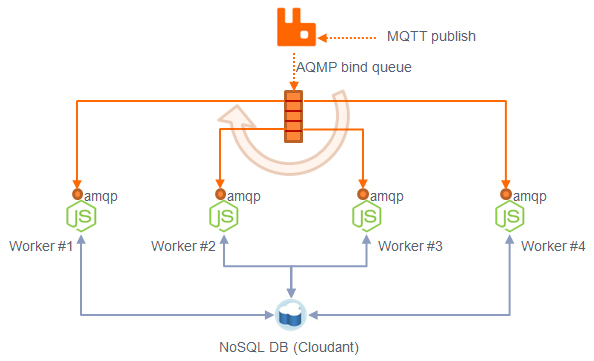 The way RabbitMQ works for pub/sub topologies is that publishers post to ‘topic’ exchanges, that are bound to queues using routing keys (in fact, there is direct mapping between AMQP routing keys and MQTT topics – it is trivial to map back and forth). The problem we were having by using MQTT client on the consumer side was that each cluster instance received its own queue. By dropping to an AMQP client and making all the instances bind to the same queue, we let RabbitMQ essentially load balance the clients using ’round-robin’ policy. In fact, this way of working is listed in RabbitMQ documentation as work queue, which is exactly what we want. System.out.println(" [x] Sent to MQTT topic '"
The client above will publish to the ‘activities’ topic. What we now need to do on the receiving end is set up a single queue and bind it to the default AMQP topic exchange (“amq.topic”) using the matching routing key (again, ‘activities’). The name of the queue does not matter as long as all the Node workers are using it (and they will by the virtue of being clones of each other). // Wait for connection to become established. Implementation detail: RabbitMQ MQTT plug-in uses the default topic exchange “amq.topic”. If we set up a different exchange for the MQTT traffic, we will need to explicitly name the exchange when binding the queue to it. There are scenarios in which it is actually beneficial for all the workers to receive an identical message. When the workers are managing Socket.io chat rooms with clients, a message may affect multiple clients, so all the workers need to receive it and decide if it applies to them. A single queue topology used here is limited to cases where workers are used strictly for scalability and any single worker can do the job. From the more philosophical point of view, by resorting to AMQP we have broken through the abstraction layer and removed the option to swap in another MQTT broker in the future. We looked around and noticed that other people had to do the same in this situation. MQTT is a pub/sub protocol and many pub/sub protocols have a ‘unicast’ feature which would deliver the message to only one of the subscribers using some kind of a selection policy (that would work splendidly in our case). Unfortunately, there is no ‘unicast’ in MQTT right now. Nevertheless, by retaining the ability to handle front end and devices publishing in MQTT we preserved the nice features of MQTT protocol (simple, light weight, can run on the smallest of devices). We continue to express the messaging side of our APIs using MQTT. At the same time, we were able to tap into the ‘unicast’ behavior by using the RabbitMQ features. That seems like a good compromise to me. Here is hoping that unicast will become part of the MQTT protocol at some point in the future. Then we can go back to pretending we are running a ‘mystery MQTT broker’ rather than RabbitMQ for our messaging needs. Nudge, nudge. Wink wink. Say no more. 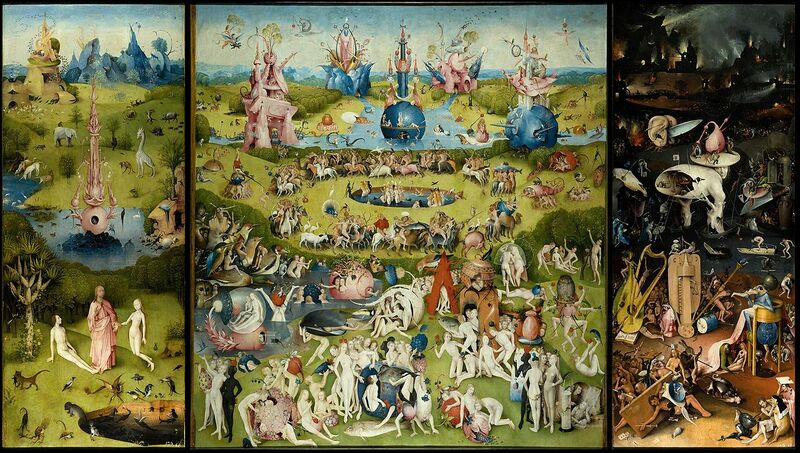 Hieronymus Bosch, “The Garden of Earthly Delights”, between 1480 and 1505. In India, we don’t call it “Indian food’. We just call it “food”. It appears it can be passed on as well. My 14-year-old daughter recently went to the mall to buy clothes (alone, a rite of passage of sorts). She returned empty-handed – ‘there was nothing nice’. I think we confirmed paternity right then and there. Of course, this affliction carries over into my professional life. Readers who follow me for a while can attest my hemming and hawing about Node.js – should I stay or should I go, what if it is not ready, what if it turns out to be just a fad, what if I read a bad review after we port everything. At least in my professional choices I appear to be more decisive than when looking at Banana Republic sweaters. After we jumped into Node.js waters in January this year, there was no turning back. It is almost April now and my mid-term report is due. One of the beneficial things of ending the agony and giving Node a chance is that you stop worrying about HOW things are done and focus on GETTING them done. And once you do it, like Rajesh above, Node.js recedes into the background and the actual problems you are trying to solve become your focus (you are not solving problems in Node, you are just, you know, solving problems). Xenofobic people who get to know ‘the other’ are often surprised that under the surface of difference there is a sea of sameness – people around the world have similar worries, hopes, fears and joys. In Node, you still have to worry about security, i18n, performance, code structure, user experience, and Node is not the only player involved in this – just one tool in your toolbox. One of the most important roles in converting an organization of any size to Node.js is that of influencers. People like myself who push for it, look for opportunities to get ‘camel’s nose under the tent’ (to borrow from Bill Scott), find a crevice where Node can squeeze and then expand like ice in the road potholes (I should know, I keep avoiding them this cold March in Toronto all the time). It is a startup of sorts, an inverted pyramid that can easily fall sideways if the founder flinches or loses hope and vision. On the other hand, it can remind you of the locked potential of the people. There is a dark lake of passion in all of us, often trapped under a layer of dealing with day to day stress and ‘things that need to be done’. It is heart-warming to see that when you succeed in winning people over to the Node.js side, the passion bursts out and they jump in with enthusiasm and vigor that is great to experience. One of the most important jobs of an influencer is to prevent failure on stupid technicalities. People ready to yell ‘I told you Node was not ready’ are everywhere. Node is awesome, but we all know that a single uncaught exception can crash the process. A JEE container can throw exceptions like a leaky barge, filling up the logs, but it will stay up. In Node, it is your responsibility to prop Node up, a Weekend at Bernies’s of sorts. Judging by the frequency of questions about this behaviour, it is hard to stomach by people moving over from the other platforms. JEE is in fact not that different. When an uncaught exception is thrown in a simple Java program with ‘main’, it exits. When the same happens in a JEE container, the runnable running in a thread exits. The thread is reset, returned to the thread pool, and the next request is passed on to another thread. In a production system with Node.js, it is your responsibility to replicate this behaviour. In Node, attempting to handle an exception by surrounding asynchronous code with a try/catch is like chasing a greased pig. It is somewhat easier to end up with an uncaught exception in Node.js than it is in Java. Due to the asynchronous nature of Node, trying to surround a piece of code in a try/catch block is often futile. Exceptions can and will escape. This is such a tricky problem that it warranted the high priests of Node to huddle recently and release a detailed and super useful document that anybody trying to write production quality Node.js system should read and internalize. It goes without saying then that you will never run ‘node myApp.js’ except during development. In production, you want to spread out to cover all the cores of the machine or VM you are running on. You want to restart the process when it exits (and it will, repeatedly). And finally, it would help to monitor CPU, memory and throughput of each running process. We are currently looking at PM2 for this, but as always with Node, there are other ways of addressing this need. WebSockets – one of the first things you will try to do after getting the CRUD down is server push – after all, Data Intensive Real Time (DIRT) is what initially catapulted Node into our consciousness. After you get the code working on your machine, inspect the entire path to the browser on your system – proxies are surprisingly cranky when it comes to support for Web Sockets. NGINX didn’t have it until version 1.3. If you are using Apache, note that it will not let the Web Socket connections through unless you install and configure mod_proxy_wstunnel. Of course, this is not Node-specific, but chances are you are most likely to hit it with Node because of its affinity to server push. 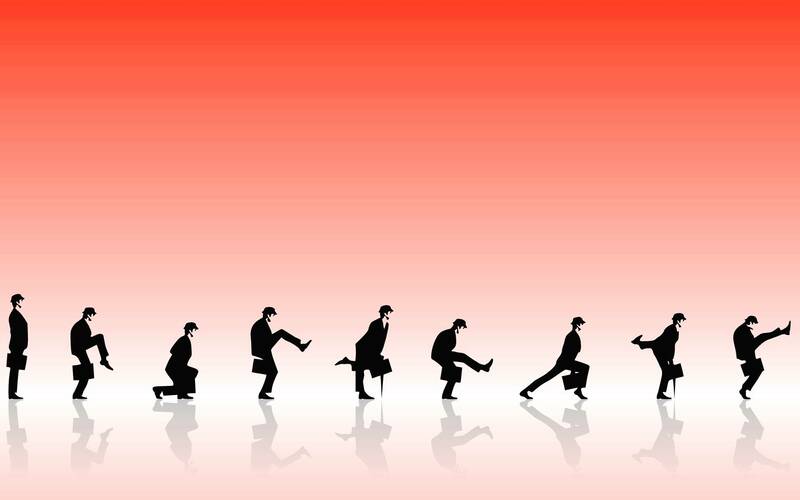 DevOps – make them your friend. If you thought Continous Integration and Continous Deployment was a neat idea, you will find it absolutely indispensable once you start getting real with Node. A well established pattern here is a system composed of micro-services, and it is not uncommon to juggle dozens upon dozens of separate Node apps performing a role in the system. You will go mad trying to manage micro-services by hand. Of course, once you get your DevOps going, the ability to deliver new features into a micro-service with surgical precision will bring no end of joy, particularly if you are replacing a JEE pig that takes minutes to restart. Zero downtime is a reachable goal in a micro-service based system comprised of Node processes. In IBM Rational, we use Urban Code, which is natural to us since we bought them recently. Do what you need to do to go automatic. Authentication and Single Sign-On – if there is anything that will remind you of the Ford Model T (you could order it in any colour as long as it was black), it will be authentication and SSO in your system. Nothing will uncover unnecessary complexity of the authentication schemes used in the system like trying to move it to something that is not JEE-based. The complexity is normally hidden in the JEE filters, and is uncovered as soon as you try to replicate it in Node.js. It is technology agnostic as long as you use Java. The good thing is that with a sympathetic team on the other end, this serves as a catalyst to finally simplify and clean up the protocol or switch to something saner. Legal – if you are in an enterprise of any size, you will not be allowed to just use whatever you find on the Internet (even startups find software promiscuity to have side-effects as soon as they grow enough to attract legal attention). Our legal department probably hates us – the amount of Node.js modules they need to vet is staggering, but the mountain of requests is tapering down. For example, the Markdown app I mentioned earlier in the post needed to vet only the markdown module – all the other modules were already encountered by the apps before it. At this rate, the flow will slow down to a trickle soon. So there you go – three months after our foray into Nodeland, we are lining up several new Node micro-services, the sky didn’t fall, we are learning new things every day and worry more about what we are building than how we are building it. Every once in a while we are forced to solve a problem for the first time. We agree on the best practice together, write it down for others coming after us, and move on. Where we can, we rely on the efforts of people before us, allowing suites such as Kraken.js to let us focus on what is really unique about our code, rather than the boilerplate. Our lawyers hate us, but if ‘tried and true’ was the only criterium when choosing our tools and languages, we would be still writing everything in Cobol. If only I was this decisive choosing my last Home Theatre receiver.